From the Michael Waltrip Racing Facebook page. Total Sports Blog takes our preview focus to Michael Waltrip Racing today. The organization the finished 2nd in points during the 2012 NASCAR Sprint Cup Series Chase for the Sprint Cup. This season the team will field three entries, including the No. 15 of Clint Bowyer, the No. 56 of Martin Truex, Jr, and the No. 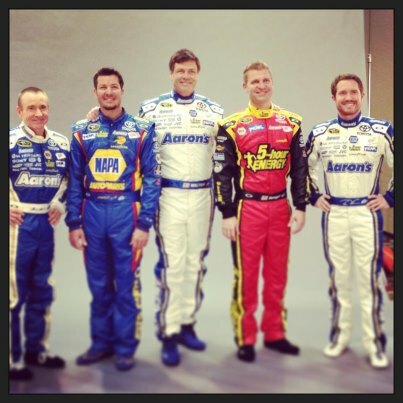 55 that will feature a combination of drivers including Mark Martin, Brian Vickers, and team owner, Michael Waltrip. Can they capture the Sprint Cup this season? They have the team to do it. This season, Clint Bowyer, who shocked the NASCAR world when he finished 2nd in points in his first year with Michael Waltrip Racing, is back with his crew chief, Brian Pattie. There was no adjustment period for the two, and hopefully there is no sophomore slump for the dynamic duo. Some say if it wasn’t for the last lap melee at Talladega Superspeedway in October, the No. 15 would have been running for the championship at Homestead. Sponsors for the No. 15 this season include 5-Hour Energy and Peak Antifreeze. Baring any slumps for the team, expect the No. 15 to be a strong contender for the title. Bowyer’s teammate, Martin Truex, Jr., had an interesting season last year. He came close to winning so many times but just came up short. While the consistency paid off and got the No. 56 in the Chase, he only finished in 11th place. Look for Truex and Chad Johnston, his crew chief, to finally get the monkey off his back and get to victory lane. The last time Truex was there was in 2007. For the second year in a row, there is no full time driver for the No. 55, but it seems to work. Last season the trio of drivers were able to finish in 15th place in the owners points. This season, Brian Vickers, Mark Martin, and Michael Waltrip will team up again. Vickers will run 9 races, while the team owner will win three, two at Talladega and the July Daytona race. With such a great driver lineup, there would be no surprise if the No. 55 landed in Gatorade Victory Lane in 2013.